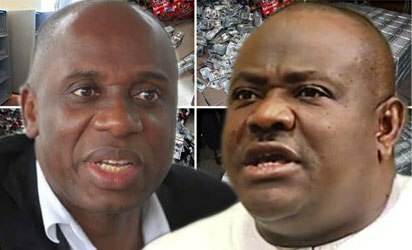 In a state broadcast to mark the landmark Supreme Court Judgment striking out the appeals by Rivers APC on Thursday, Governor Nyesom Ezenwo Wike called on the Minister of Transportation, Chibuike Rotimi Amaechi to join hands with him to develop the state. Wike said that Rivers State stands to benefit more if all leaders are united. He said: “Although the present politics of acrimony and bitterness may have strayed from the noble path of the past, I still believe that we shall be better of standing and working together for our state and our people. I therefore appeal to the APC and the Minister of Transportation to join hands with us to develop our dear state. We cannot as leaders continue to remain divided and expect Government to deliver on its responsibilities to our people. Let us from henceforth seek the common ground instead of allowing our differences to be exploited to retard our march to progress. “I appeal to our people to eschew all acts of acrimony, criminality, unrest, and violence throughout the State. I wish to recommit myself to continue to do all that is humanly possible to ensure the unity and peaceful co-existence of all our people irrespective of political affiliation”. He has since directed the State Attorney General and Commissioner to review all pending criminal cases linked to politics before the 2019 elections and make necessary recommendations to promote reconciliation. He also pledged to run an inclusive Government aimed at promoting the developing the state.